For help in planning your cruise event, fill out the email form on the right or call 617-748-1435 for additional information. 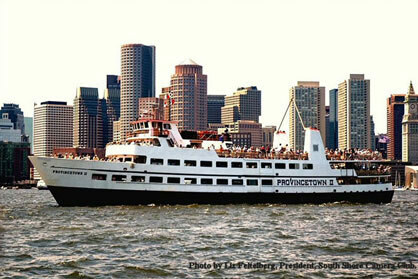 Nothing can beat the feeling of going out on the water aboard the Provincetown II, Boston Harbor’s largest cruise ship with room for groups of 100 to 900 passengers. Enjoy the views of Boston’s glorious skyline or the beautiful harbor islands from our ship’s immaculately maintained and expansive open decks. In the grand tradition of coastal steamers, the Provincetown II will provide your group with unequaled spaciousness and simple elegance. The ship is outfitted with table seating for 160 passengers, perimeter seating for hundreds more, a fully enclosed deck, semi enclosed deck, and the enormous top deck. Along with the ship’s three fully stocked bars, the Provincetown II’s large dance areas will ensure a wonderful time on the water, in all weather. Our crew is the most experienced in the harbor and is well known for delivering the friendliest and most professional customer service on the water. We are also able to tailor an event to include catering, theme parties, sightseeing cruises, and water transportation. Conveniently located at the World Trade Center in the Seaport District, your guests won’t have to struggle with city congestion or overpriced parking. 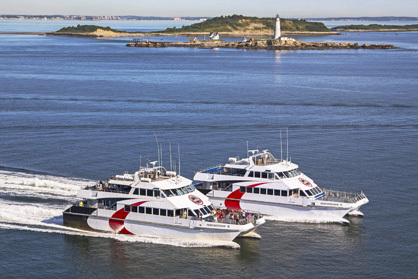 Enjoy the exclusivity and convenience of your own privately chartered whale watch aboard one of our high-speed catamarans, the newest vessels in Boston Harbor. We will sail at a time convenient to you and your group, custom tailoring an itinerary to your needs. 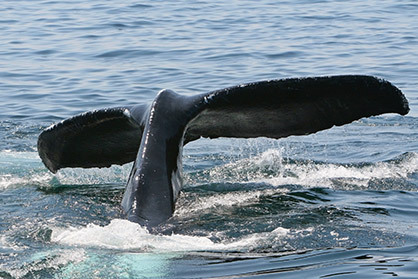 Plan on an overall voyage time of roughly three hours in order to take in the glorious sight of the whales on Stellwagen Bank National Marine Sanctuary. The cost of chartering our vessels begin at a 75 person minimum of $40 per passenger, or $3,000. Bay State Cruise Company offers discounted rates for 20 or more people aboard our Provincetown Ferry, Summer Music Cruises, and Sightseeing Tours of Boston harbor. Spend the day enjoying the shops, art galleries, & beautiful beaches of Provincetown, dance the night away under the stars on Boston largest ship, great for bachelorettes or let us customize your cruise featuring the harbor, islands, food, and entertainment. We are located in the Seaport District close by to major highways. Convenient bus drop and pickup located adjacent to our ferry. Our ships feature climate control, open air decks, comfortable seating, fully stocked bars offering hot and cold drinks and a variety of light snacks. Our Bay State crew is focused on providing outstanding and conscientious service. Providing ultimate customer service is our goal. We look forward to welcoming you onboard! Email us or call 617-748-1435 for additional information. Ask about our Ferry + Trolley + Lunch package. For questions, please email us at: julie@baystatecruisecompany.com.